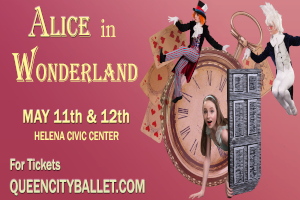 Queen City Ballet Company presents the wonderful, whimsical Alice in Wonderland May 11th & 12th at the Helena Civic Center. Follow Alice down the Rabbit hole in this wildly entertaining ballet inspired by Lewis Carroll’s much-beloved book. In this captivating tale of curiosity and adventure, Alice journeys through Wonderland Garden joins the Mad Hatter’s Tea Party and plays croquet with the infamous Queen of Hearts. Along the way, she meets a beloved cast of colorful characters including the harried White Rabbit, the cunning Cheshire Cat, flamingoes, cards, flowers, hedgehogs and more. This imaginative production features professional vibrant sets, elaborate costumes, and splendid dancing by over 60 dancers from the nationally recognized Queen City Ballet Company & Conservatory dancers.